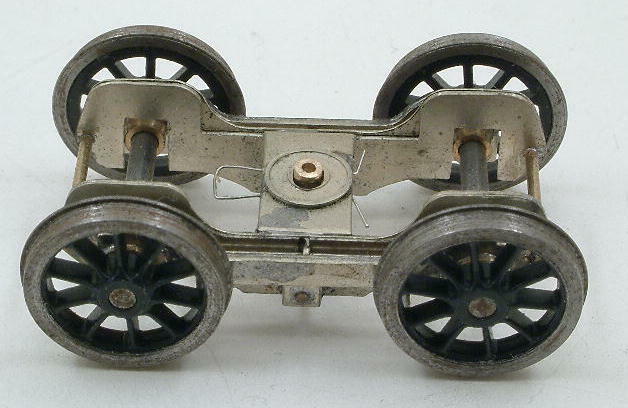 This is the Bill Bedford pre-production version of the 2P bogie etch based on the ballraced one. 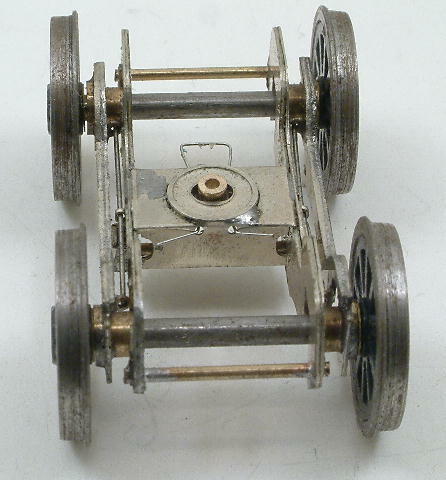 It works on the principle that pitch in the bogie frame is undesirable, and all the movement of the wheels in the pitch plane should be under the control of the equalising springs. Vertical translation is controlled by both springs at the same time, longitudinal translation of the wheelset is minimised by the bearing sleeves making contact with the cutout edges in the frames, and transverse translation is controlled by the wire clip around the pivot pin. Rotation in the roll plane is controlled by the side springs in compression. Rotation in the yaw plane is free, apart from any friction in the rubbing plate. The design supposes that the whole of the rubbing plate remains in contact with the fixed bolster at all times, so the bogie frame has no roll or pitch freedom with respect to the rest of the chassis. The suspension spring wires are bent to 90° at one end (the far end in the first picture). Each wire is cut to a length such that the bent over end cannot quite release the other end before it fouls the bearing. Assembly is done without the axles in place, and is easier than it looks. The straight end goes through the equalising beam fulcrum, then through the centre fulcrum on the frame plate, and with the equalising beam offcentre so that the two fulcrums are next to each other, the wire end can be popped through the third one easily. The bent end has to be curved round the bearing at its end, but that isn't a big problem. The beam can then be centralised where it will pop into place. Changing the wire involves removing both axles. Contrary to my philosophy and usual practice, I know, but I couldn't think of a better way, and we all have to compromise sometimes. Note that it is important that the suspension wire is in line as near as possible with the centres of the bearings. If it is outside, the beam will try to tip, causing the bearings to bind on the axles and prevent the wheels rotating. The bearings are not soldered to the equalising beam, to allow them some roll freedom. All of the fulcrum points are fold out from the etch, therefore shorter and more convenient than handrail knobs. One modification I had to make; Bill etched the central pivot box of the beams in with them. This had to be cut off and soldered to the frame separately, for purely cosmetic purposes. The function of this box is carried out by the central fulcrum on the frames, as curved multi-leaf springs with central eye clamps are not readily available in 4mm scale.